Nearly every seat at the sale was full. It was surely a day of mixed emotions as Faith Livestock Auction hosted one of the biggest horse sales in their existence on Sept. 1. Buyers were from as far north as Canada and from California to Florida to witness and buy generations of proven AQHA breeding programs. A partnership that began many moons ago between the Lopez's and the Meyers walked through the doors and were offered for sale for the last time by these 2 great breeders. Bob and Karen Meyer of Glad Valley offered stallions, mares and weanlings. The highlight of the sale was Star Struck Dun It, 2002 Buckskin Stallion sired by Hollywood Dun It out of Starleenic X Grays Starlight selling for $13,000 and will be standing at Fleetwood Farms Quarter Horses Alberta Canada and Four Star Quarter Horses (Patton Family) of Dublin Ohio. Fleetwood Farms also acquired Lot #7 Larks Shorty Lena (own daughter of Rugged Lark) as the 3rd highest selling mare of the Meyer's Program for $5,000. Another great stallion from the Meyers program, SNW Northern Frost will be traveling just down the road at Parade SD at the Jim & Sharon Wright ranch. Their high bid of $9,250 won the son of PC Joes Frost out of the legendary Sun Frost. Jim Wheatley of Hughson, California purchased Frosted Sunman, 1999 Buckskin Stallion, sired by PC Frenchmans Mark X Sun Frost and out of Ima Sweet Note sired by Snippys Cowboy for $8,250. He also purchased two Drop Of Frost Daughters to add to his program. 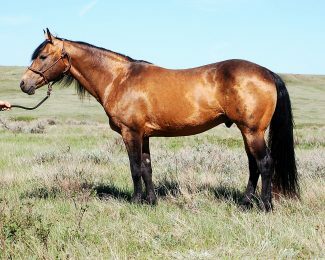 Irish Goldmine, a 2015 Brown Mare sired by Irish Pay out of Little Black Bird was the high selling mare fetching $7,500 by Jace Booth. She is carrying a SNW Northern Frost foal for delivery in 2019. Lot 5, Dam of Irish Goldmine, Little Black Bird (Ninety Nine Gold Mine AAA X Wonders Florida AA) was the 2nd top selling mare at $5,250 and will be joining Kit Miller in Amidon ND. Lee Lopez dispersed his last 2 mares with colts at side at the same sale. Frenchmans Parfait, a daughter of Frenchmans Guy, will make his home in Buffalo WY at the Davis Ranch after claiming a $5,000 bid. Jeff Anderson of Pierce NE purchased Streek of Red (Cee Heart Concho X PC Skipper) which goes back to the great Lopez Stallion Hunkey Tonk and PS Sun Socks on the bottom side. 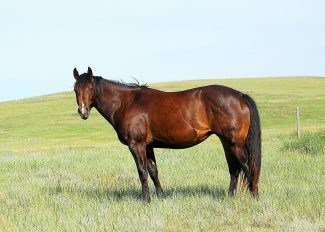 Many breeding operations took advantage of the outstanding bred mares sold. $4,210 was the average of the top 10 mares sold. There was a total of 36 mares sold with an average of $3025. The top 14 weanlings averaged $2,214. with Lot 50 of Bob & Karen Meyer's with a final bid of $3,600, a buckskin stud colt by Frosted Sunman X Starlight Patzi. Denny & Doris Lauing's high selling weanling was a sorrel filly sired by Colonel Frenchman out of Comos Hickory Cash, a home-raised mare out of their former stallion Lil Easy Feature and out of a mare that goes back to their senior sire Comos Cottoneye. Guest Consigners Glen & Janet Long's high seller was Lot 93 fetching $2,100, a bay roan stud colt out of Watch Me Go Cowboy X Gunsmoken Cowgirl. 4 yearlings were brought by guest consigners Ross Potter and Lane Lamphere of Sturgis that goes back to the Lauing's great stallions Colonel Frenchman and Dare To Be French. Lot 83 Pecos Two the Hilt (Dare To Be French X Chex Two the Hilt) brought an outstanding bid of $3,800 belonging to Ross Potter. An outstanding bunch of riding horses were offered as usual. Archie Hulm's was the high seller Larks Fox bringing $8,750 originating from the Meyer's program was purchased by Gill Red Angus, a 2014 sorrel gelding by SNW Northern Frost X Larks Shorty Lena. Lil Frenchmans Peppy, a 2015 gray gelding (Frenchmans Hickory X LL My Gray Peppy Gal) consigned by Jake Moreland claimed $6750 purchased at a previous sale from the Lauing's. Kyle Edoff brought a 2012 sorrel gelding that won $5,500. Denny & Doris Lauing brought a 2015 gray mare Miss Comos Peppy (Colonel Frenchman X Comos Hickory Badger) that found a new home in Wyoming at $4,750. Trainer Sarah Moreland had put 90 days on the mare. On behalf of Bob & Karen Meyer, Lee Lopez and Denny & Doris Lauing, we would like to extend our immense gratitude to those that attended in person, on-line or on the phone that bid on and purchased our horses. Thank you to Lynn Weishaar and John Johnson for doing a fabulous job as well and to the ringmen Dan Piroutek and Scott Dirk. Thanks to Faith Livestock Auction and their crew for doing an outstanding job and to Doc Ford. Special thanks to the consigners Glen & Janet Long, Ross Potter, Lane Lamphere, Archie Hulm, Skyler Hulm, Kurt Holt, Jake Moreland and Kyle Edoff. Even though the public witnessed the complete dispersions of 2 great lifetime horse programs, know that the sale will go on. 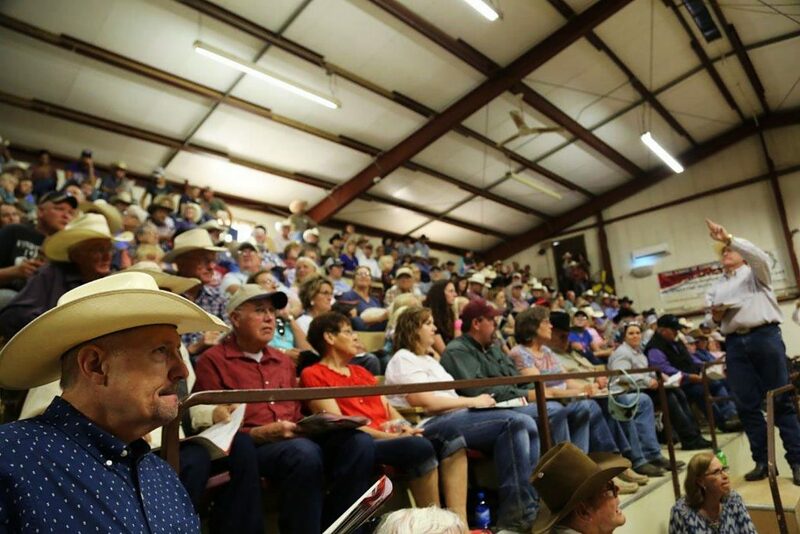 Denny & Doris Lauing will head up the 2019 sale on September 7th and will continue bringing ranch and arena quality horses along with reputable consigners as the Lopez, Meyer & Lauing Sale has done the past 43 years.